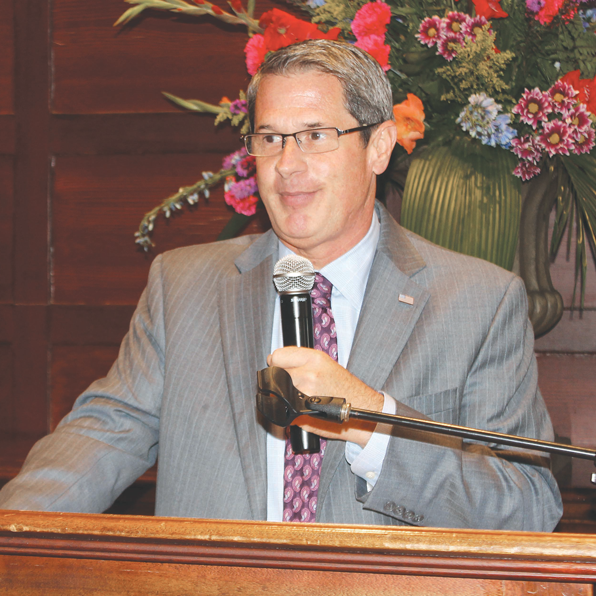 BATON ROUGE — The Republican Party of East Baton Rouge Parish honored Sen. David Vitter with the first-ever Ronald Reagan Man of the Year Award last Friday at the City Club. The event, which was packed out, raised money for Republican activities in the parish this fall. The party honored Vitter for his commitment to limited government, individual rights, lower taxes, free enterprise, traditional values, and a strong national defense, according to Richie Edmonds, master of ceremonies. Paying tribute to Vitter were Mayoral candidate Mike Walker, State Rep. Valarie Hodges, and Family Forum president Gene Mills. Sen. Vitter: The Obama administration’s initial reaction to the attacks on the U.S. consulate in Benghazi, Libya was to apologize rather than to root out the terrorists who attacked our Ambassador and diplomats. Recent evidence suggests that Obama knew about security breaches yet chose not to act. The administration also made an attempt to minimize the fact that this was a planned terrorist attack on a U.S. embassy by implying that the attacks were done by mobs upset by a YouTube video instead of organized attacks. The recent tragedy in Libya underscores the unfortunate reality that our mission to root out senseless violence from terrorists who oppose American values is not complete. As a member of the Senate Armed Services Committee, I’ll remain an advocate for a strong national defense and get answers on what the Obama administration knew about the Libya attackers. Sen. Vitter: The Obama administration has been reluctant to stand shoulder to shoulder with Israel and instead invests more good faith in the United Nations. Supporting the security of Israel, our closest ally in the volatile Middle East, is absolutely crucial. I have also been a strong supporter of stopping Iran from acquiring nuclear capabilities. Iran is currently the world’s largest state sponsor of terrorism. The current Administration must be held accountable for stopping Iran from becoming a nuclear-armed Iran. Sen. Vitter: President Obama wants you to believe that domestic energy production is up. That’s false. Meanwhile, the administration continues to oppose expanding domestic energy production on federal lands and the Outer Continental Shelf. They oppose common sense projects like the Keystone XL pipeline which would create jobs. The Obama administration’s wrong direction on energy policy is stifling domestic production, causing gas prices to rise. Since the United States is the single most energy-rich country in the world, we should be increasing domestic energy production and also supporting job creating projects like Keystone. I introduced the leading Republican legislation 3-D: The Domestic Jobs, Domestic Energy, and Deficit Reduction Act, which would create more than two million jobs by unleashing America’s vast domestic energy potential. Sen. Vitter: The Obama administration wants amnesty for illegal immigrants. He’s working on doing so by pushing gateway amnesty programs like the DREAM Act and providing immunity to those who are brought into the United States as children. Weak enforcement of our immigration laws allows our immigration system to be taken advantage of. Illegal immigration is a very severe problem and immigration reform should focus on securing our border and enforcing the laws already on the books. We should advance policies giving U.S. border security agents the tools they need to fight illegal immigration, eliminate child tax credit handouts to illegals and enforce laws so that illegals cannot vote in our elections. Sen. Vitter: President Obama talks about the need to tackle our spiraling debt and deficit while pushing through major debt and spending initiatives like the stimulus and the auto bailouts. I supported measures that cut government spending, cap how much the government can spend overall, and balance the federal budget over time. We’re 16 trillion in debt, and none of the president’s budgets have been serious about debt reduction.